Early in the morning of August 21, 1863, Confederate guerilla forces led by William Clarke Quantrill, 1837-1865, attacked Lawrence, Kansas, killing nearly 200 people and burning most of the town. 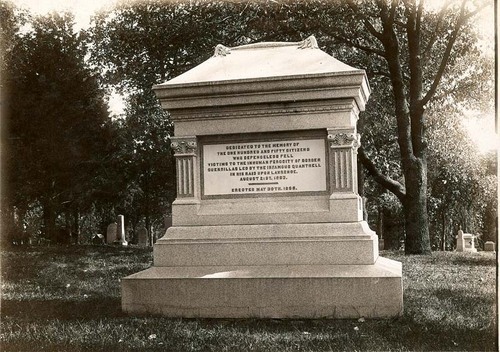 This stone monument, erected to honor the victims of Quantrill's Raid, is located in Oak Hill Cemetery in Lawrence, Kansas. It was unveiled on May 30, 1895. The inscription on the memorial follows: Dedicated to the memory of the one hundred and fifty citizens who defenseless fell victim to the inhuman ferocity of border guerillas led by the infamous Quantrill in his raid upon Lawrence August 21, 1863. Erected May 30, 1895. Early in the morning of August 21, 1863, Confederate guerilla forces led by William Clarke Quantrill, 1837-1865, attacked Lawrence, Kansas, killing nearly 200 people and burning most of the town. This stone monument, erected to honor the victims of Quantrill's Raid, is located in Oak Hill Cemetery in Lawrence, Kansas. It was unveiled on May 30, 1895. The inscription on the memorial follows: Dedicated to the memory of the one hundred and fifty citizens who defenseless fell victim to the inhuman ferocity of border guerillas led by the infamous Quantrill in his raid upon Lawrence August 21, 1863.